Wilmington Priory was originally a mid 11th century small Alien Priory Cell of St Mary, founded by Herluin de Conteville. The Benedictine abbey of Grestein in Normandy held lands here at Domesday and the priory was constructed and run more like a grange than a monastery. 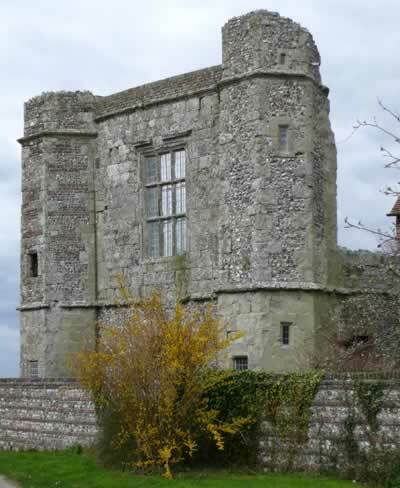 In 1243, the cell appears to have been enlarged to accommodate several monks under a prior but in 1414 it was suppressed and given to the Dean and Chapter of Chichester, who remained the owners until 1565 when it was then given to Sir Richard Sackville. In the early 14th century, a southern two storey porch was added to the old hall and later in the century the porch was given a new defensive entrance, with a portcullis. The house with its plain parapets, was never embattled but a three storey drum tower flanked the north-west angle of a new chamber block. This drum tower was destroyed in the late 18th century but the southern façade of the 14th century first floor hall flanked by polygonal angle stair turrets, still stands to its full height. A mile west is The Rookery Arlington and 7 miles east is Pevensey Castle. Wilmington Priory is located in the village centre, off The Street. 7 miles north-west of Eastbourne, on the A2270-A27. The site is leased by The Landmark Trust and can be let has holiday accommodation. The site is visible from the road.